The current lack of transparency in clinical trials threatens progress on the Sustainable Development Goals' health objectives. Unreported and misreported clinical trial outcomes result in the misallocation of public health funds, reduced pandemic preparedness, and a slowdown in the development of new vaccines, treatments and cures. Donors can strengthen trial transparency by promoting the adoption and implementation of the World Health Organization's best practices, rescuing unreported trial results from the global pile of research waste, and supporting transparency initiatives. Clinical trials are a key driver of medical innovation and progress, but the existing evidence base on drugs and vaccines is incomplete and systematically biased due to the opacity of clinical trials. This may have a substantial negative effect on global health, and directly threatens progress on seven of the targets set out by Social Development Goal 3. US$ 85 billion out of the US$ 170 billion spent on health research globally every year goes to waste because research results are not reported.4d1b8f506ab8 Incomplete, inaccurate, misleading and slow reporting of results causes funders and scientists to repeatedly explore the same dead ends, which drives up the time and cost required to develop new vaccines, treatments and cures. Because the evidence base underlying medicine is fragmentary and distorted, global health bodies, donors and health agencies, including those in the Global South, cannot reliably determine the comparative cost-effectiveness of different treatment options. This leads to suboptimal allocation of scarce public health funds, undermines pandemic preparedness, and directly harms individual patients. This policy brief provides an overview of the issue, based on a more extensive study published by Transparency International, Cochrane, CRIT and TranspariMED in 2017.011204e6acb1 In addition, it outlines simple and cost-effective steps that donors can take to curb research waste, accelerate medical progress, and improve public health in the Global South. The chart below, based on a widely cited analysis of a cohort of 74 clinical trials of antidepressant drugs,fe7a7ffacc88 illustrates how non-publication and evidence distortion can combine to create a severely misleading picture of the effectiveness of drugs. All but one of the 38 positive clinical trials were published. 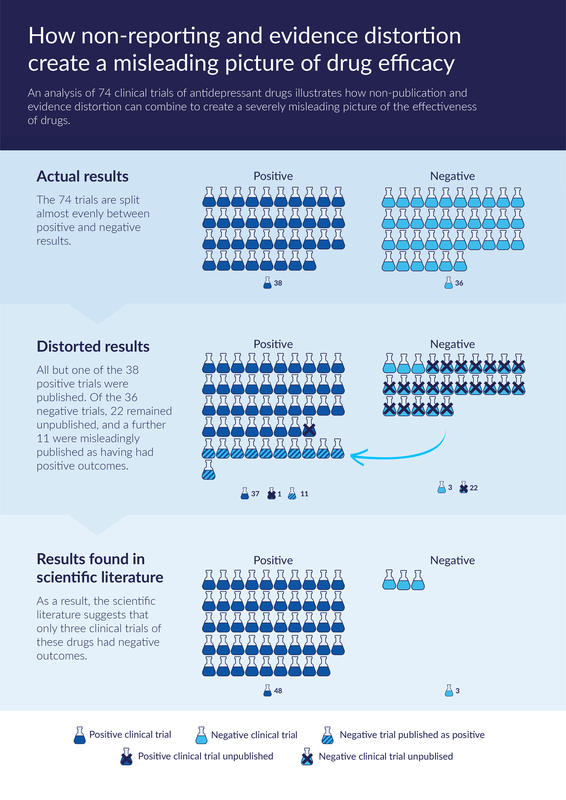 Of the 36 negative trials, 22 remained unpublished, and a further 11 were misleadingly published as having had positive outcomes. As a result, the scientific literature suggested that only three clinical trials of these drugs had negative outcomes. Importantly, these problems are not limited to clinical trials funded or run by pharmaceutical companies. In fact, numerous studies show that trials funded or run by public health bodies, universities and the third sector are even less likely to report their results.148b2dddcebf1b66f88e61e4 Evidence distortion too is widespread beyond industry due to a combination of perverse incentives, weak institutional oversight and a lack of effective deterrents. Source: Chart based on the findings of Turner et al. (2008). The problem of unreliable evidence affects medical research and clinical practice across all disease areas and regions, including on health issues of particular concern to the Global South. For example, at the outset of the 2014 Ebola outbreak in West Africa, scientists discovered that potentially life-saving information from past clinical trials was missing. This led to major inefficiencies in testing for Ebola therapeutics. A 2017 review of Ebola trials on the world’s largest trial registry Clinicaltrials.gov found that not a single one had posted its summary results there, despite 30 trials having already exceeded the 12 month disclosure timeframe set by the WHO.b6c9ea3c5d35 In some cases, the results of these trials had not been published in the academic literature either and therefore remained inaccessible to the scientific community. The level of transparency of clinical trials will directly affect the extent to which seven out of the 13 health targets set out under Social Development Goal 3 will be achieved. Most obviously, the non-reporting of trials undermines Target 3 (ending the epidemics of AIDS, tuberculosis, malaria by 2030) and Target 11 (supporting the research and development of vaccines and medicines). In addition, as long as the evidence base of medicine remains severely distorted, Target 9 (access to safe and effective medicines and vaccines) will be difficult to achieve because public health agencies are currently unable to reliably evaluate the safety and effectiveness of drugs. This, combined with the overall slower pace of scientific progress, will also hinder the achievement of Targets 1, 2, 4, and 5. Signing up to the 2017 Joint Statement commits clinical trial stakeholders to ensuring that all clinical trials they fund, co-fund, sponsor or support adhere to global best practices in clinical trial transparency.9d351c091f45 These include prospective trial registration, the posting of summary results on registries within 12 months of trial completion, monitoring of grantee compliance, and the publication of monitoring reports. As the Joint Statement itself emphasises, “[t]he resource allocation, public health and scientific benefits – together with the need to meet ethical imperatives – far outweigh the costs” of the proposed monitoring mechanisms. Stakeholders who fund clinical trials commit to global best practice in clinical trial transparency by signing the 2017 Joint Statement. In May 2017, the UK’s Department for International Development (DFID) became the first bilateral donor agency to sign up to the Joint Statement. Several organisations that receive international development funding, including Médecins Sans Frontières, the TB Alliance, and Medicines for Malaria Venture have also signed up. Other bilateral donors could promote clinical trial transparency by following the lead of DFID, sign up to the Joint Statement, and fully implement its provisions. In addition, donors could require all grantee institutions involved in funding or conducting clinical trials, including universities at home and abroad, to sign up to the Joint Statement and publish the stipulated annual monitoring reports as a precondition for receiving future grants. In addition to strengthening the global evidence base on drugs and vaccines and accelerating medical progress, this would mitigate the fiduciary risk of taxpayers’ money contributing to the US$ 85 billion in research waste generated annually through the non-reporting of medical research results. Furthermore, donor agencies could encourage public research funders within their home countries to sign up to the Joint Statement. The largest public research funding institutions in Australia, Canada, China, Germany, Italy, Japan, Spain and the United States have yet to sign up. Clinical trials typically cost several million dollars to set up and run. In contrast, posting their summary results onto registries costs only around $2,000;bd3fd8852cd8 the cost of publishing their results in academic journals is similarly low. Donors could fund systematic efforts to retrospectively publish the results of clinical trials concluded in the past that have failed to report their results. The medical knowledge generated by these trials will be lost forever unless their results are rescued soon, before the researchers involved retire and the underlying datasets disappear. Retrospectively publishing the results of unreported clinical trials would be an extremely cost-effective global health intervention. As the cost of making trial outcomes publicly available is minimal compared to the original cost of conducting the trials themselves, this would be an extremely cost-effective global health intervention. In addition, donors could assist public research agencies in the Global South in implementing the provisions of the Joint Statement, as the Indian Council of Medical Research has already started to do. Donors could provide technical assistance to other agencies in major developing countries in the setup of appropriate monitoring systems and facilitate peer-to-peer knowledge exchanges. Making institutional performance visible and challenging institutions to post missing trial results has yielded tangible results. In addition, donors could support think tanks in conducting policy research and advocacy around relevant legal and regulatory frameworks,6e5bb66c6818 and in integrating clinical trial transparency concerns into mainstream global and national health policy debates. Out of US$170 billion total annual research waste, fully half (US$ 85 billion) is due to non-reporting of results. Glasziou, P. and Chalmers, I. . 2016. Is 85% of health research really “wasted”?, The BMJ. Pharmaceutical companies have repeatedly been prosecuted for withholding drug safety and efficacy data from clinical trials. For example, a US$ 3 billion settlement reached in the United States in 2012 was partially related to the concealment of trial data on the drug Avandia and resulting patient deaths. For a detailed account, see Bruckner T and Ellis, B. 2017. Clinical trial transparency: a key to better and safer medicines. Transparency International et al. 2017. Clinical trial transparency: a guide for policy makers. AllTrials. No date. How many clinical trials are left unpublished? An accessible overview of the issues discussed here and of the relevant literature is provided by Transparency International et al. 2017. Clinical trial transparency: a guide for policy makers (http://www.transparency.org.uk/publications/clinical-trial-transparency/) and Goldacre, B. 2012. Bad Pharma: How drug companies mislead doctors and harm patients, 4th Estate (http://www.4thestate.co.uk/book/bad-pharma-how-medicine-is-broken-and-how-we-can-fix-it-epub-edition/). Goldacre, B. et al. 2016. The Centre for Evidence Based Medicine outcome monitoring project (COMPare) protocol, CEBM, University of Oxford. Turner, E. H. et al. 2008. Selective publication of antidepressant trials and its influence on apparent efficacy, New England Journal of Medicine. Nather, D. and Piller, C. 2016. Biden threatens funding cuts for researchers who fail to report clinical trial results, STAT News. WHO. 2015. WHO statement on public disclosure of clinical trial results. United Nations. 2016. Report of the United Nations Secretary-General’s High-Level Panel on Access to Medicines. Tang, E. et al. 2015. Comparison of serious adverse events posted at ClinicalTrials.gov and published in corresponding journal articles, BMCMedicine. The cases of Lorcainide and Tamiflu are discussed at length in Bruckner, T., and Ellis, B. 2017. Clinical trial transparency: a key to better and safer medicines. Bruckner, T. 2017. Where's the data? Missing trial results undermine pandemic preparedness, Devex. WHO. 2017. Joint statement on public disclosure of results from clinical trials. Hoffmann, T. 2017. Focus on sharing individual patient data distracts from other ways of improving trial transparency, The BMJ. The BMJ. 2014. The CEA second-look trial: a randomised controlled trial of carcinoembryonic antigen prompted reoperation for recurrent colorectal cancer, BMJ Blogs. Two transparency tools developed by EMB Data Lab in 2018 facilitate advocacy efforts. These two online ‘trials trackers’ automatically flag trials that violate existing US (https://fdaaa.trialstracker.net/) and European Union (http://eu.trialstracker.net/) disclosure rules. Universities Allied for Essential Medicines and TranspariMED are jointly developing another transparency tool. STAT News have already made their 2015 and 2018 data sets publicly available. AllTrials website. No date. List of supporting organisations. Miseta, E. 2018. Can "trial shaming" force companies to report results? Clinical Leader; Goldacre, B. 2018. Our FDAAA TrialsTracker is already helping to get new trials reported, EBM Data Lab blog; TranspariMED. 2017. Aberdeen Uni Pledges Audit of Clinical Trials Transparency Performance; TranspariMED. 2017. Bristol University pledges clinical trial registry cleanup. Piller, C. and Bronshtein, T. 2018. Faced with public pressure, research institutions step up reporting of clinical trial results, STAT. Piller, C. 2015. Failure to report: A STAT investigation of clinical trials reporting, STAT and Piller, C. 2016. Leading research entities routinely and flagrantly ignored their obligations to report trial results, Interview with AllTrials. Nather, P and Piller, C. 2015. Biden threatens funding cuts for researchers who fail to report clinical trial results, STAT News. Maruani, A. et al. 2014.Impact of sending email reminders of the legal requirement for posting results on ClinicalTrials.gov: cohort embedded pragmatic randomized controlled trial,The BMJ. The numbers of clinical trials relevant to many disease areas are so small (<100) that the data can be compiled manually, obviating the need for specialist IT skills. EBM Data Lab is currently working on two such disease-specific manual ‘trackers’, which will provide useful templates for replication. The Collaboration for Research Integrity and Transparency (CRIT) at Yale Law School provides an interesting model for national-level research on clinical trial laws, regulations and policies.